Nancy Jo Archer of Albuquerque ran Hogares Inc., one of the organizations cleared of fraud Monday. The organization closed is doors in 2014 because of lack of funds. The New Mexico Attorney General exonerated 10 health providers of fraud charges Monday, a significant reversal for Gov. Susana Martinez’s administration, which accused 15 organizations of wrongdoing more than two years ago and forced some out of business after stopping the flow of government dollars to them. “While we did find some regulatory violations, there did not appear to be a pattern of fraud for any of the ten completed investigations,” Attorney General Hector Balderas said in a two-page letter. Balderas’ announcement reverberated through the Roundhouse on Monday, where many were left to ask why the Martinez administration pursued the criminal cases in 2013 despite apparent weaknesses in its case against at least 13 of the 15 organizations accused of fraud. The state’s decision to find ‘credible allegations of fraud’ and to stop the flow of government dollars to the 15 organizations disrupted care to tens of thousands of vulnerable New Mexicans struggling with mental illness or drug addiction. It also caused staff layoffs and at least one pharmacy’s temporary shutdown. More than two years later, the effects still ripple through the state. Recently, New Mexico cities and regions scrambled to find care for those affected when two of five Arizona organizations the Martinez administration brought in to replace the New Mexico operations departed the state, saying the ventures were too financially difficult. New Mexico, meanwhile, faces possible payouts to the affected New Mexico providers who have sued the state of New Mexico in federal court. A spokesperson for the Human Services Department on Monday took issue with the AG’s decision to not prosecute the organizations, implying — but not providing proof — that there was enough evidence for a prosecution. The 10 providers cleared of wrongdoing by Balderas on Monday were: Border Area Mental Health Services, Partners in Wellness, Youth Development, Inc.,Southern New Mexico Human Development, Hogares, Families and Youth, Inc., Counseling Associates, Southwest Counseling Center, Presbyterian Medical Services (PMS), and Valencia Counseling Services. That brings to 13 the number of organizations originally accused of fraud that have been cleared of wrongdoing. Balderas’ predecessor, Gary King, cleared one organization — Counseling Center of Alamogordo — while Balderas cleared two others — Easter Seals El Mirador and Service Organization for Youth — in 2015. Balderas said his agency continues to investigate TeamBuilders and Pathways. ‘These two investigations are ongoing and will require that we take additional time in order to ensure that our conclusions are sound,” Balderas wrote. Nancy Jo Archer, who ran the 43-year-old Hogares Inc., stood in front of a scrum of reporters Monday afternoon, struggling to maintain her composure. She was grateful for the Attorney General’s exoneration, she said. “But it does not erase the fact that this agency does not exist …,” Archer said and then stopped to collect herself. “And that kids and families still are not getting services. The bottom line: all of us lost our agencies, we lost our jobs, but more importantly, kids and families aren’t getting services,” she continued. A few of the 15 accused organizations are still operating around New Mexico but many have exited the ‘behavioral health’ side of Medicaid after the state’s decision to accuse them of fraud. Hogares of Albuquerque is one of nearly half a dozen organizations around New Mexico that no longer exist in any form. Hogares tried to survive but closed in May of 2014 due to lack of money, Archer said. Despite being cleared Monday, Archer said New Mexico is still demanding Hogares pay $9 million for what it calls over-billings — money that Hogares does not have. “That’ll be like getting blood from a turnip,” Archer said, adding that she doesn’t know how the state came up with the $9 million figure. Southwest Counseling Center in Las Cruces is another organization that disappeared. Roque Garcia, its former CEO, lamented in an e-mail about what he called the administration’s personal attacks and the upheaval the state’s decision caused in many lives. “These actions have also made it impossible for many of us to find a job in the health care field in the state,” Garcia wrote. Hogares, Southwest Counseling Center and other organizations have sued the state of New Mexico in federal court for what they say are violations of of their due process rights, among other things. Meanwhile, those organizations that still survive say their finances have been hit hard. Mark Johnson, CEO of Easter Seals El Mirador, said Monday his organization laid off 150 employees and recently was assessed $300,000 in increased unemployment claims because the former workers did not go to work for the Arizona company that replaced them in providing services to those struggling with mental illness and addiction. Moreover, El Mirador has paid more than $250,000 in legal fees to fight the state’s accusations, he said. Diego Gallegos and Jack Siamu of Youth Development Inc., another organization accused of fraud, said staff helping clients has shrunk from 20 to five. And the families served by YDI has gone from 750 to 1,000 families to 275 to 300. When the state made its case against the 15 organizations it accused of possible fraud in June 2013, New Mexico made it sound like a slam dunk. The New Mexico Human Services Department announced that it had found nearly $36 million in potential over-billing and possible Medicaid fraud based on an audit and other reports. The state’s actions came under scrutiny early on, however. Based on a reading of federal guidelines and regulations New Mexico In Depth found that the state’s Human Services Department did not have to withhold Medicaid dollars from the 15 organizations it had accused of fraud, although the state has repeatedly maintained it had no other option. The state, meanwhile, repeatedly refused to make public a more-than-400-page audit it had used to find ‘credible allegations of fraud,’ leading New Mexico In Depth, along with media partner Las Cruces Sun-News, to unsuccessfully sue the state to turn it over. Media organizations and the public weren’t the only ones unable to review the audit. The accused organizations weren’t allowed, either — with the exception of two organizations that settled with the state in late 2013. It wasn’t until Attorney General Hector Balderas took office in January 2015 that the audit became public. What few knew at the time of the June 2013 announcement was that the HSD had removed a sentence on page 22 of draft audit report by a Massachusetts firm commissioned to review the 15 organizations’ billing. The sentence HSD removed by the Massachusetts firm — Public Consulting Group Inc. (PCG) — said that the auditor had found no “credible allegations of fraud” in its Case File audit. A review of the final audit report exposed interesting findings, too: Nearly $34 million of the $36 million in potential over-billing and possible Medicaid fraud started with only $42,500 in questionable claims PCG had flagged upon a review of all 15 organizations over a three-and-a-half-year period. The $42,500 was based on a review of thousands of cases, a very small fraction of all the claims submitted by the 15 organizations over that three-and-a-half year period. Using a statistical formula, PCG predicted the potential over-billing and possible fraud among the millions of claims the organizations had submitted over that three-and-a-half year period based on the rate of suspicious claims it had found in the documents it had reviewed. Usually, PCG allows organizations they are auditing to review preliminary findings before a report becomes final; it’s common practice in audits to ensure findings are accurate. But the Human Services Department (HSD) did not allow PCG to do that with the organizations the state accused of fraud. As a result, in early investigations that cleared some of the organizations of fraud allegations, AG investigators found documentation the PCG audit described as missing. In other cases, they found individuals who the audit flagged as improperly providing services because of a lack of credentials to have the proper accreditation for their jobs. It also meant the estimates of potential over-billing and possible fraud in the audit weren’t accurate. That put Presbyterian Medical Services (PMS) in a bind: it could settle the case the state had made against it or fight it and possibly run out of money. The health care provider chose to settle and paid the state $4 million in the fall of 2013 all the while objecting to findings in a state-ordered audit that it had over-billed Medicaid. On Monday, Presbyterian CEO Steve Hansen said he didn’t regret that decision to settle with the state. 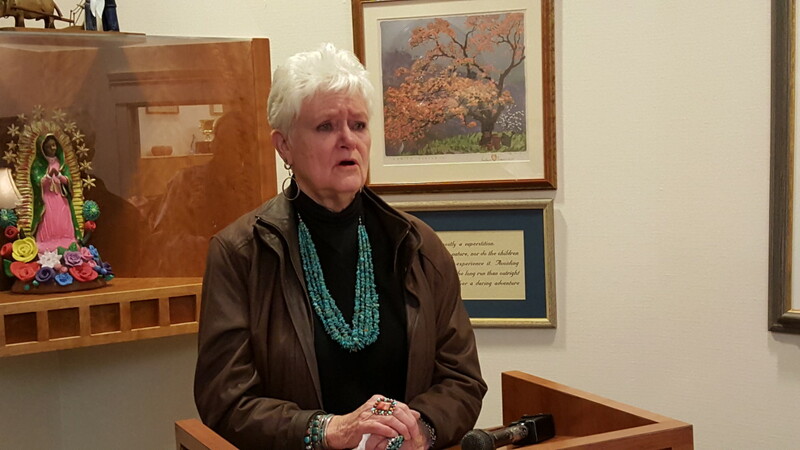 Fighting New Mexico would have closed down the agency, Hansen said. “We would have stopped providing services to the state and the communities, and so even though it was painful — and scary — we never slowed any services, we never stopped any services and our staffs continued to do what was right for our patients, and so, yes, it was expensive, we don’t regret that we continued services,” Hansen said. See a timeline of events here. Attorney General Hector Balderas’s office announced today it has cleared TeamBuilders and Pathways, the final two behavioral health organizations the state of New Mexico accused of ‘credible allegations of fraud’ in 2013. This is a developing story.